Most of the data included in the new sections can be considered as invariant parameters. That is, they can be used as default values for any new model. The new parameters allow for greater control of the DXF results and add some new features. This version 2.90 is the result of working intensively in the source code of LEparagliding :) There is a lot of invisible work in subroutines and code improvement. - Section 26 allows the vents part to be attached automatically to the extrados or intrados at will. Already explained in version 2.85. - Section 21 Joncs definition (nylon rods), now fully functional. Now it is possible to define type 1 rods, which are the most used. A rod on the leading edge with small deflections at both ends, which are completely controllable in position and depth of deflection, with 8 parameters. The program calculates the rods and shapes of the pockets, which are also fully controllable in widths, with 4 parameters. It is possible to define different rods for each cell, individually or by groups. Of course, sections 26 and 21, save a lot of drawing work with CAD, and now the paraglider is almost finished from the program. - Extension of the DXF-2D plans to an array 4 rows x of 7 columns (28 plans). 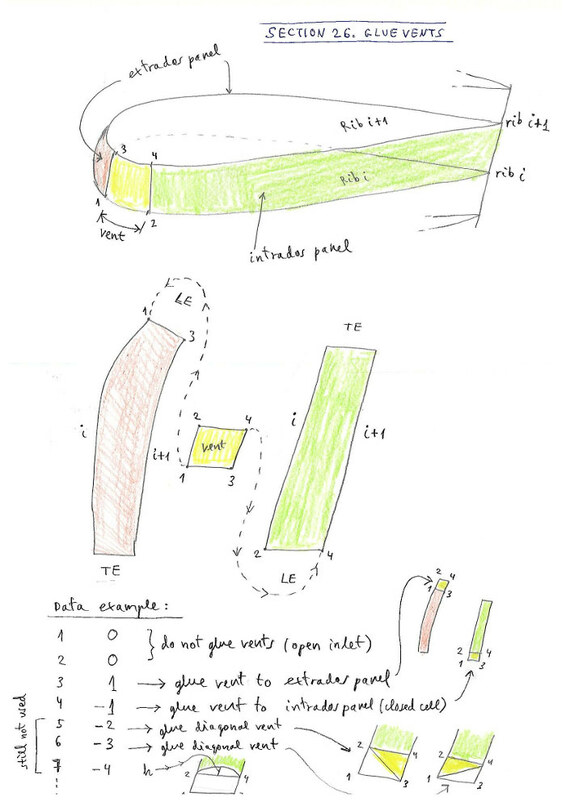 Plan 1-7 used for rods. New plan 4-7 includes general text notes for constructor. The work of the division in colors, is only with a section of partial help (marks of reference). And the division in 3D panels on the leading edge and the improvement of the skin tension module, are the following works. Following my drawings, it is now possible to add one or two cuts in 3D, but it is a lot of work if the paraglider has many cells. That's why we will automate! Version 2.90 includes as example the paraglider BHL5-Bi 31 m2 "etude version", still working. The program now generates completely finished plans, ready to build and fly! Version GUI Graphical User Interface, It is also evolving, thanks to a Swiss programmer... But for now, you need to try to understand my drawings and cryptic explanations and write the parameters directly into the text file! The data structure of the new sections is described below, to be added below the 18th section. This section allows the user to choose some layers names in the DXF files. To facilitate the edition and modification of DXF files. In version 2.75 only the layers "points" "circles" and "triangles" are functional. text2: layer name for minicircle points, to choose freely (with character and space restrictions). Minicircles as alternative for points. text2: layer name for minitriangles, to choose freely (with character and space restrictions). Used is some special marks (tabs). text2: layer name for minisquares, to choose freely (with character and space restrictions). Used is some special marks. text2: text layer name, to choose freely (with character and space restrictions). text2: reference layer name, to choose freely (with character and space restrictions). text2: notes layer name, to choose freely (with character and space restrictions). 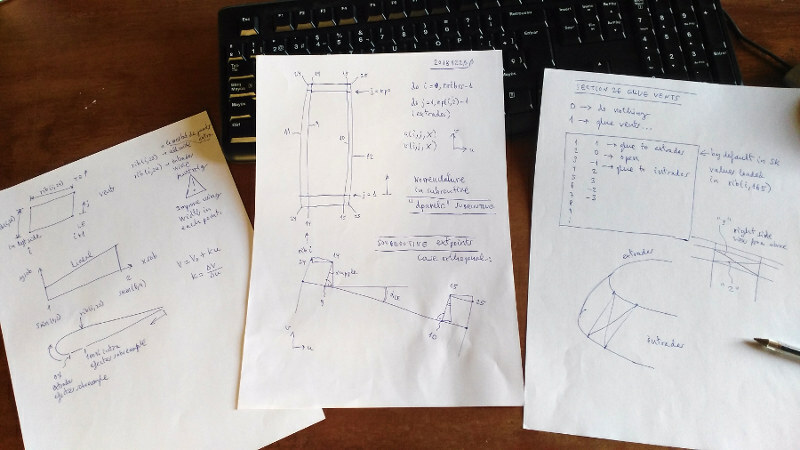 This section allows the user to choose different types of marking elements in DXF files (one-dimensional points, minicircles, triangles, segments, ...). This is especially useful for laser cutting plotters, and the ability to adapt marking to manufacturer preferences. 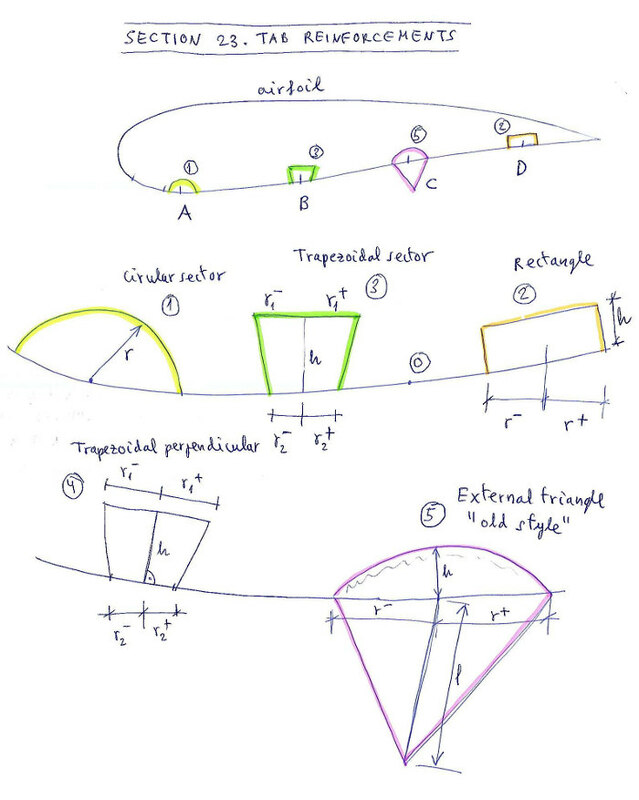 Remember that leparagliding generates two types of plans, some for use with conventional printer ("print" version), and others for professional use with computerized cutting plotters ("laser" version). Section now fully functional. Now it is possible to define type 1 rods, which are the most used. A rod on the nose with small deflections at both ends, which are completely controllable in position, transition, and depth of deflection, with 8 parameters. The program calculates the rods and shapes of the pockets, which are also fully controllable in widths, with 4 parameters. It is possible to define different rods for each cell, individually or by groups. If you don't need rods, leave the value to "0". Lines 7,8,9 repeat same definitions for the group 2, and so on until final group. Note that it is possible to define as many groups as profiles have the wing, and thus define a different rod for each profile. But normally with a group or two it is sufficient for the whole wing. This section allows the user to draw nose mylars. 2. 3.0 1.0 13.5 3. 1. This section allows the user to draw tab reinforcements. Still not functional. Leave the value to "0". - Scheme 1, using tab type 1 (circular sector), parameter "0" means use units in % of chord, and 5 parameters to define the tab. In this case only the radius r.
- Scheme 2, using tab type 2 (trapezoidal sector), parameter "0" means use units in % of chord, and 5 parameters to define the tab. In this case r1-,r1+,r2-,r2+,h. - Scheme 3, using tab type 5 (circular sector), parameter "0" means use units in % of chord, and 5 parameters to define the tab. In this case only r-,r+,h,l. The shape of the triangle is calculated automatically taking into account the inclination of the line in space. The length "l" is discounted at the final length of the line. - Scheme 4, using tab type 2 (rectangular sector), parameter "1" means use absolute units in cm, and 5 parameters to define the tab. In this case only r-,r+,h. 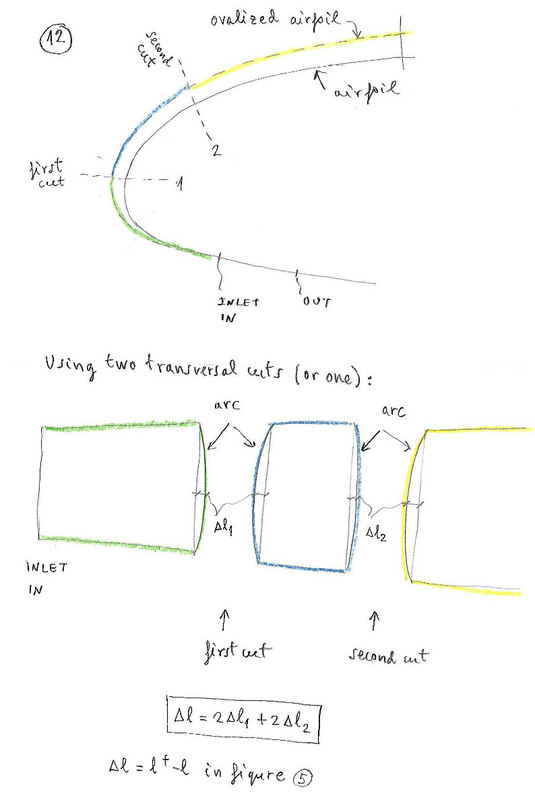 This section allows the user to define some colorsin the 2D DXF plans. 1= red, 2=yellow, 3=green, 4=cyan, 5=blue, 6=magenta 7=white 8=dark grey 9= grey,... up to 255 depending on your color palette. It is preferable not to use colors with more than two digits. This section allows the user to define some colors in the 3D DXF plans. 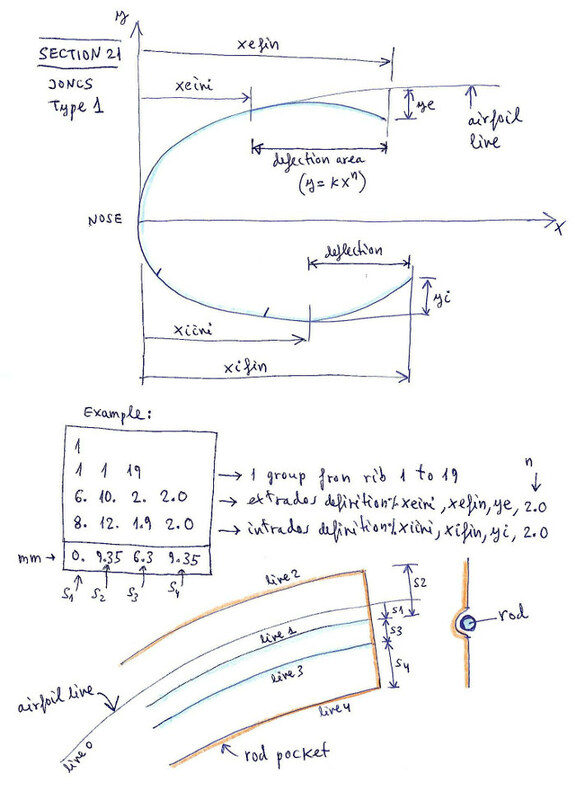 Allows to draw unifilar not ovalized versions of the surfaces. This section allows to automatically "glue" the air inlets (vents) into the panel of extrados, intrados, or to separate them. The vents include sewing edges. The skin tension i the vent is linear and automatically corresponds to that defined at the points correspondingin extrados and intrados. 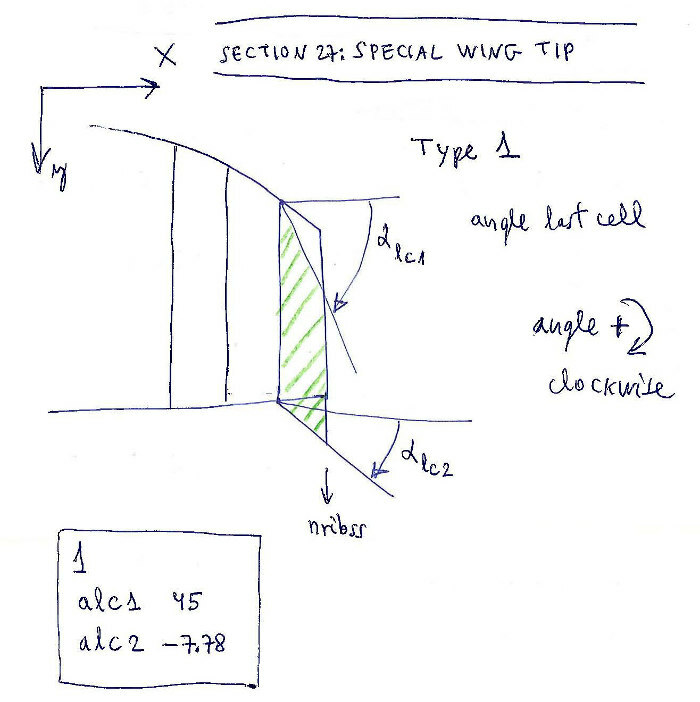 "1" refers to define "type 1" wing tip modifications. It is planned to define several modifications. Type 1 is the simplest. "AngleLE" is a name not computed. It serves to remember that next we have to write the new angle in degrees between the horizontal and the leading edge in the last cell. It is usual to force the angle of the last cell, and this section allows it to be done without modifying the geometry matrix. Set 45º for example. "AngleTE" is a name not computed for the trailing edge. Set the angle as desired, -7.78º for example. Study the variations in the riser lengths and calage when applying speed system or trim system. 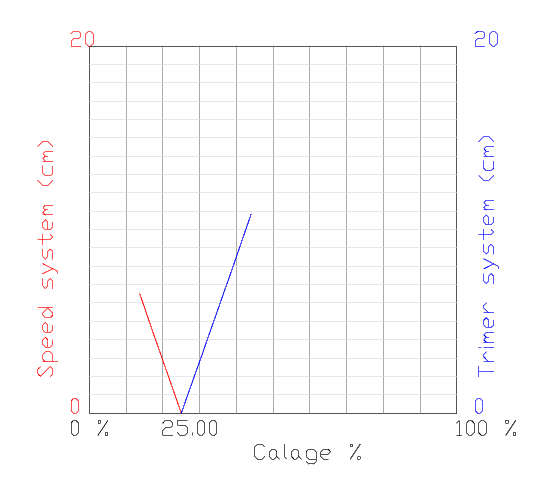 It is interesting to experiment with new calages in prototypes or to define the speed or trim systems. 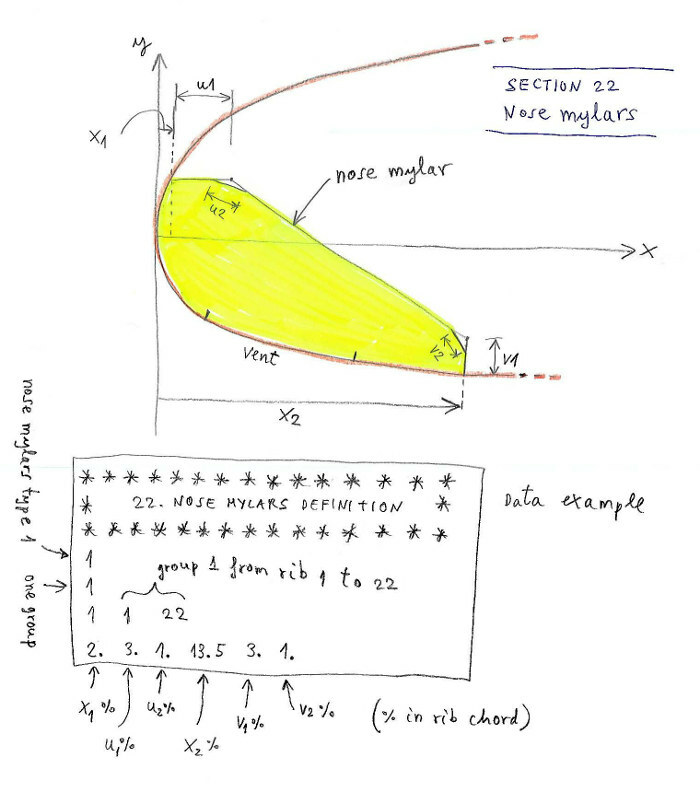 Figure 7a. 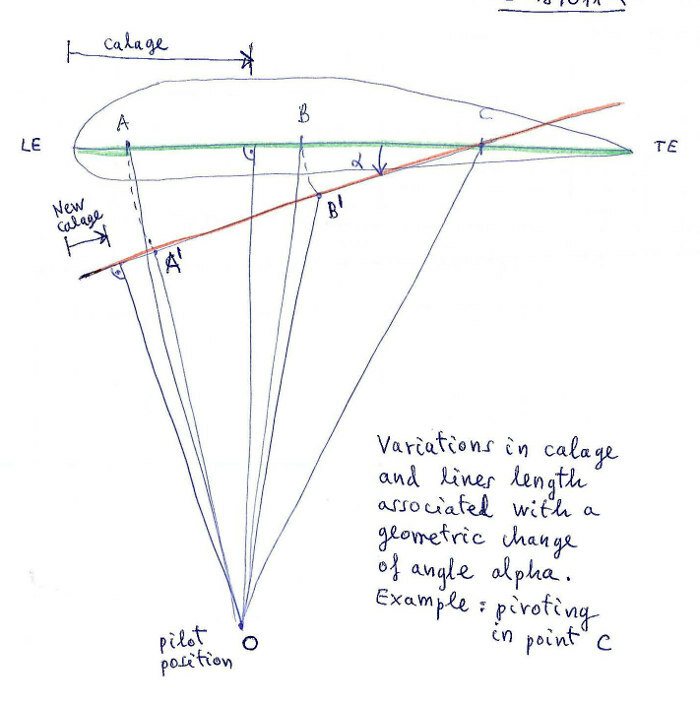 Principles of the study of the calage variations. 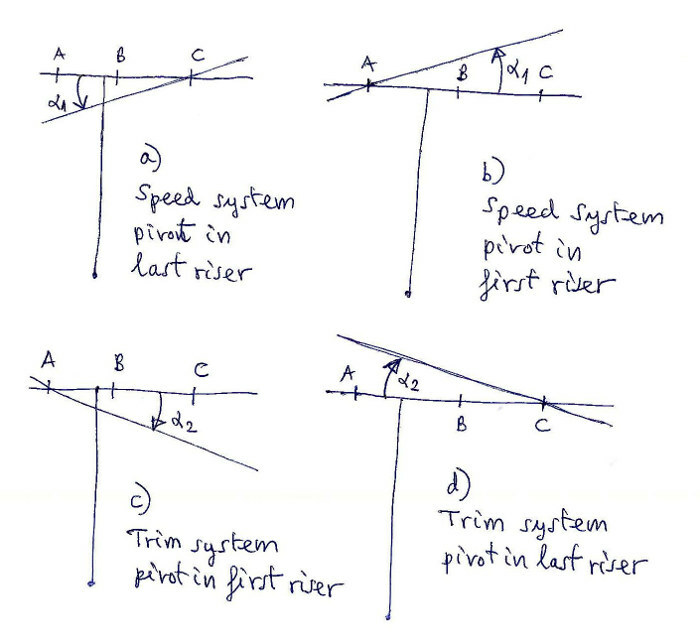 We study the variations in the riser lengths when applying accelerator (speed system) pivoting in the last riser (most common case), which remains with constant length. For practical purposes we define a negative alpha angle of pitch increased in N1 spaces gradually, and then we compute the variations in the line lengths and calage. We do the same study, assuming a trim system that increases the picth angle in N2 spaces gradually. In this case, the most usual is to consider the constant length A riser and the other variables in length. if integer = 1 do calage study "type 1"
Coefficients of amplification or reduction of the thickness of the cells. Normally define as "1.0", or "0.0" in the wingtip. * Skin tension group number "1" from rib 1 to 4, 6 points, type "1"
1 0. 0.0 0. 0. 6 100. 0.0 100. 0. 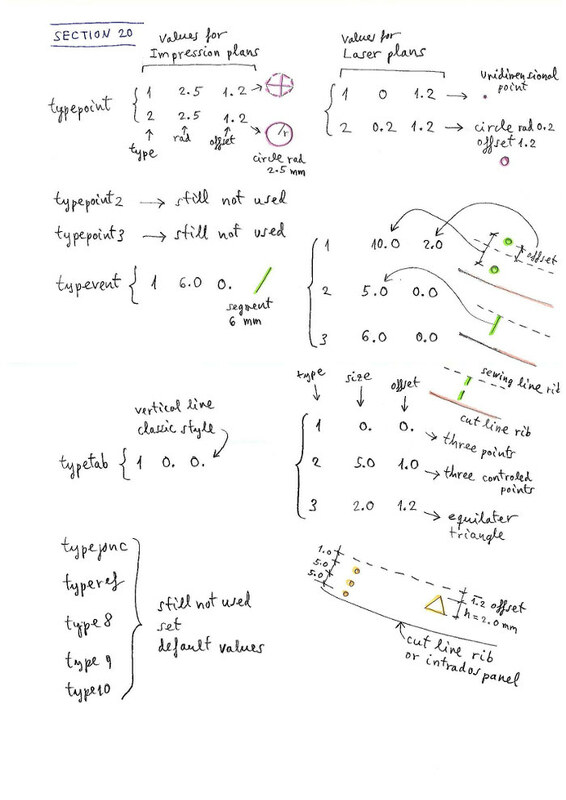 * Skin tension group number "2" from rib 5 to 22, 6 points, type "1"
* Skin tension group number "3" from rib 22 to 23, 8 points, type "1"
Data file example in 2.90 version: leparagliding.txt used in gnuLAB4 and BHL5-Bi paraglider. Readme.txt lep-2.87 include BHL5-Bi-etude example. (1) f you want to use the executable file lep-2.7X.exe on a computer, without the Cygwin console installed, then it is mandatory to use the appropiate cygwin1.dll file in the same lep directory. Select your cygwin1.dll (test all if necessary) in https://yadi.sk/d/Clzq4v9D3Y8qwJ. 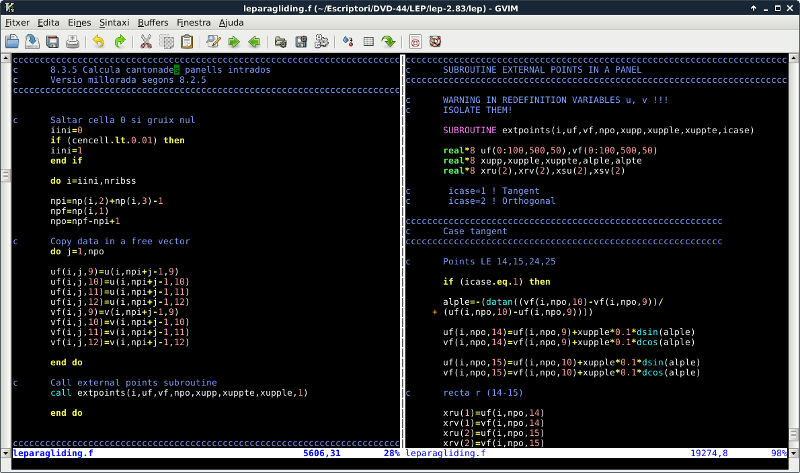 Copy .dll in the "lep" folder. Current version of LEparagliding is 2.90 "Baldiri"
And pre-processor is 1.5 "Baldiri"
I hope that next version of the program will include the long awaited options for 3D shapping!